Posted by Tantumblogo in awesomeness, Basics, Dallas Diocese, General Catholic, North Deanery. St. Andre Bessette was a French Canadian priest whose intercession regarding suffering and healing is known to be powerful. My secret correspondent sent me this, which is making my return to work/blogging much easier! See prayer for healing below. Feast is Wed. Jan. 6. 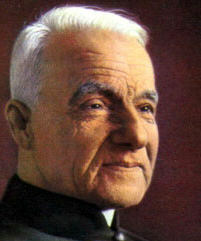 (1).Lord our God, friend of the lowly, you gave your servant, St. André Bessette, a great devotion to St. Joseph and a special commitment to the poor and afflicted. Through his intercession help us to follow his example of prayer and love and so come to share with him in your glory. (mention your intention) We ask this in the name of Jesus the Lord. Amen. I come to you in prayer for healing. You were no stranger to illness. but you never lost faith in God. in body, soul, and mind. no matter the outcome. Amen.